Posted on 22, May 2015 by EuropaWire PR Editors | This entry was posted in Automotive, Business, Construction, Environment, Infrastructure & Utilities, News, Real Estate, Technology, Transportation & Logistics and tagged Aston Martin, Aston Martin St. Gallen, Automated Parking, Automated Parking Solution, Automated Parking System, Car Dealership, cars, flagship store, Ladina Caluori, oversized parking spaces, parking, Richard Denzler, Skyline Parking AG, St. Gallen, Zurich. Bookmark the permalink. ZURICH, Switzerland, 22-5-2015 — /EuropaWire/ — Aston Martin St. Gallen builds a new dealership that combines features of the iconic sports car brand with typically Swiss characteristics to create a unique and luxurious ambience. What makes this dealership even more special is the inclusion of an automated parking system (APS) supplied by Skyline Parking AG. Besides optimizing in-house logistics, the new dealership integrates a state of the art car showroom. To impress the dealership’s premium clients further, a push of a button has the APS quickly bring selected cars to the showroom for inspection. What goes unseen in the background is the premium storage for these special, sports cars provided by the APS. Safe and secure, the APS not only eliminates dents, scrapes, theft and vandalism, it provides weather protection in a temperature-controlled, sealed parking area. The Skyline L-Park automated parking system, one of the dealership’s efficiency optimizing features, provides highly space-efficient and safe parking for up to 90 cars. With two underground levels, the Skyline Parking APS uses parking spaces with three different heights and four different lengths on six levels, to fit all of those cars into an area of less than 302 square meters (given a system height of 14 m this means 47 m3 per parking space). Skyline uses the fastest and most reliable conveyor transport system in the industry. Automated parking systems minimize the amount of land needed for parking cars by removing drivers and passengers from the parking process. Much like robotic valet parking, drivers and passengers exit their cars at the APS entrance. The empty cars are then transported to parking spaces within the APS by a fully-automated mechanical system. Automated parking systems save space by eliminating those features of conventional car parking facilities that are needed to accommodate people: driving lanes, ramps, oversized parking spaces (drivers and passengers must open car doors), lifts, walkways, handicapped parking areas, etc. Automated parking systems also eliminate the emissions produced when cars drive to-and-from or circle around searching for parking spaces. Moreover, APS are inherently far safer for people than conventional parking facilities since no one must (nor can) walk through the parking area. Cars are dropped off and picked up in well lit, highly visible lobbies at ground level. Cars and property are also more secure since no one is driving or parking near them and there is no public access to parked cars once inside the APS. 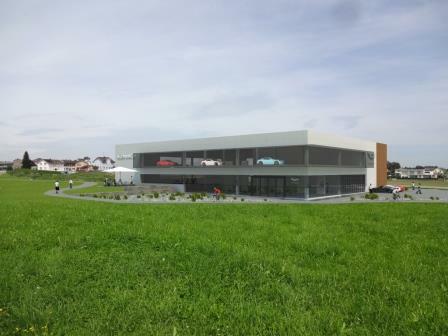 All these features make the Skyline L-Park a perfect complement for the high-tech dealership.